The Leadership of the Peoples Democratic Party (PDP) led by the Chairman of the National Caretaker Committee, Senator Ahmed Makarfi, CON has reacted to the Ruling of a Federal High Court in Abuja on Thursday July 28, 2016, presided over by the controversial Judge, Justice Okon Abang describing it as objectionable, questionable and very strange to say the least in the history of Nigeria Judiciary. The Party in a statement by its Spokesman, Prince Dayo Adeyeye declared that what Justice Okon Abang did today is to Seat on an Appeal over the Court of competent and coordinate jurisdiction and that’s what makes his Interlocutory Order very strange. The Judgment of the Federal High Court in Port Harcourt was very clear that the National Caretaker Committee was duly constituted and recognized; and in line with that, the scheduled National Convention for August 17, 2016 still holds. We have just received information that Justice Okon Abang of the Federal High Court in Abuja has granted an Order of Interlocutory Injunction stopping our scheduled National Convention in Port Harcourt, Rivers State, but we want to state that the Judgment of the 4th of July, 2016 supersedes any Ex-Parte Order or Interlocutory Injunctions. So, our National Convention will hold as scheduled in Port Harcourt, Rivers State” Prince Adeyeye said. Let Nigerians recall the two former Judgments before the Port Harcourt Judgment, declared that Senator Sheriff is not qualified to be a National Chairman given that the PDP Constitution 2014 which he claimed brought him to power is not in existence and therefore, null and void. The PDP wants Nigerians to know that Justice Okon Abang is deliberately engaging in acts of derailing the Country’s democracy given the fact that his Court is not an Appeal Court that can set aside any Judgment. He has penchant for abuse of court processes and actions of legal impunity. This Judge Nigerians will recall, issued Judgment against the Governor of Abia State that led to INEC re-issuing another Certificate of Return to a man who did not contest election thereby causing unnecessary hardship on the people of that State. He also issued an Order to INEC to recognize Senator Sheriff’s candidates in Edo and Ondo states before they could even plan their purported congress in Edo. In today’s Case, this same Judge out rightly denied the PDP representation in Court which is unheard of by serving the Plaintiff (Sheriff & Co.) who instituted the Case also as PDP (defendants). His excesses are extremely absurd, strange and unbecoming of a Judge who enjoys putting the Judiciary on the spot. We therefore bring this matter before the highest level of Judiciary in the Country to stop this Judge forthwith from waging war against the PDP. We are equally calling on Nigerians and the international community to compel Nigeria Judiciary to address Justice Abang’s excesses before he kills our hard earned democracy. However, the Party is law abiding and therefore, will apply for Stay of Execution of this Order and also Appeal it. 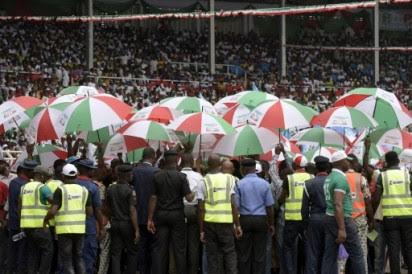 Finally, the Party calls on all its members and teaming supporters nationwide to remain calm and law abiding and be rest assured that the PDP National Convention will hold as scheduled and all preparation towards the August 17, 2016 National Convention remains the same.